Star Trek is a very rare positive vision of the future. Which movie captures the audience the most with this hopeful message? I learned python to sample all the movie ratings I could find in order to answer this question. If you follow this guide, so can you. Which one is the best Star Trek movie? To many trekkies the entries for First Contact and the Wrath of Khan won’t come as a surprise. These movies are generally regarded as high points in the franchise. However, what astonished me was just how successful the 2009 reboot was. 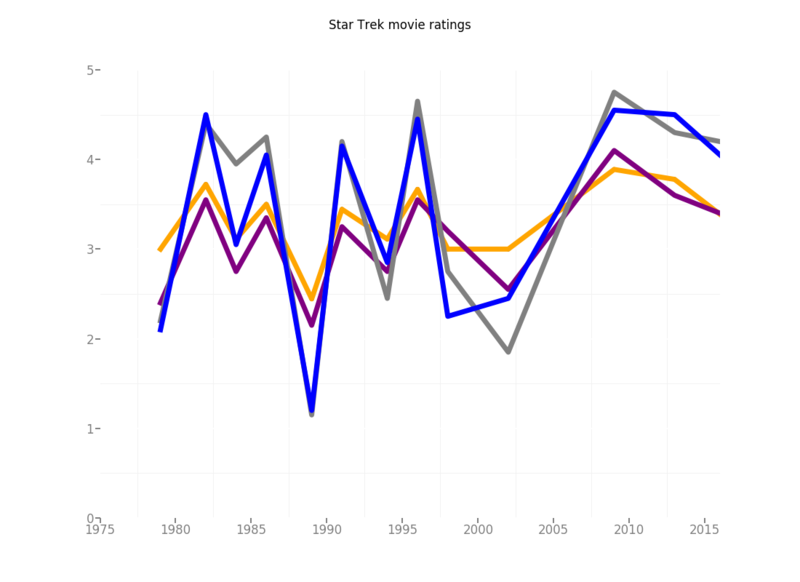 Star Trek never before managed to churn out three decent movies in a row. There is hope that the next film will be a similarly good. How you can get at all this information is shown in this blog post. Start off by loading all the necessary modules. Because of IMDb-py I use python 2.7. Next, we sample all Star Trek movies. We shall use the IMDb search function for that. Because we are not interested in series or video games, we extract only the movies with a simple list comprehension. Unfortunately, IMDb’s search function is not flawless and misses 5 movies. We search for them individually and add them to the list STF which holds the movies. Now, we can loop through each movie and add all the information we want to a pandas data frame df. The IMDb API gives access to IMDb user ratings and metacritic ratings. However, in order to get rotten tomatoes ratings we turn to web scraping using BeautifulSoup. 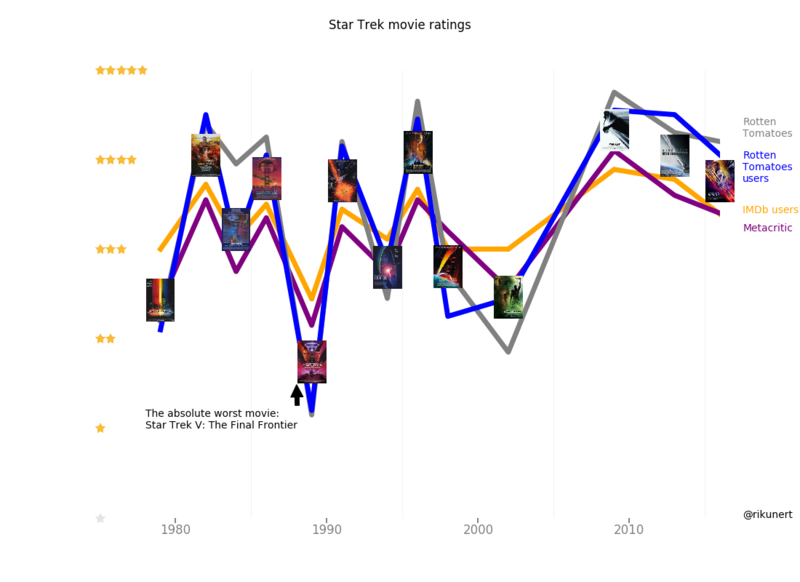 Note that different ratings use different scales. I decided to turn all of them into an intuitive 6-point scale (zero to five stars). At this point one might want to save the data, for example by calling df.to_csv('Star_Trek_movie_data.csv', sep=';'). The result can be downloaded here. I start off by using the ggplot module as I am very familiar with the syntax from R.
The plot p now holds essentially all the information we need. But it is not pretty yet, as you can see by calling print p which is what I did to produce the figure above. For visual gimicks we shall leave ggplot and turn to matplotlib. The module matplotlib works very much like matlab figure production. So, the figure should not be saved in a variable like p above, but instead be open. The first thing to improve is to tell the reader what the different lines represent. I personally believe that it is best practice to avoid separate legends and, instead, use intuitive explanations in the figure itself. How to tell the viewer which movie is where? The film posters are the easiest way to achieve this. Including an image in a plot is not straight forward. I will use the annotation box approach and hide the box itself behind the image. First off though, we need the drawing area called axes or ax. Next we define a new function add_image() to place an image from url at the coordinates xy of drawing area ax_ with the image zoom imzoom. Adding each film poster is now easy. For the ordinate (y-axis) position, by the way, I chose the average rating. I think the x-axis could be simplified. I replace the y-axis by star symbols. All in the interest of avoiding text. 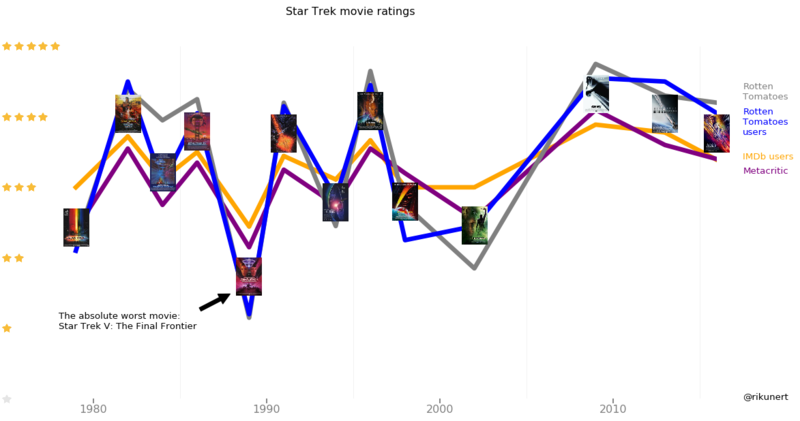 What stands out the most from the figure is just how awful Star Trek V was. Let’s highlight this.